Authorization in MQ controls the privileges to a user or a group for an MQ object. Authority check happens when queue manager or the other MQ objects are accessed. The authority information is stored as message in the system object "SYSTEM.AUTH.DATA.QUEUE" from which the Object Authority Manager(OAM) process(amqzfuma) reads and authorizes the connecting applications(internal MQ processes are also authorized). "amqzfuma" is the default OAM included with the QMGR. 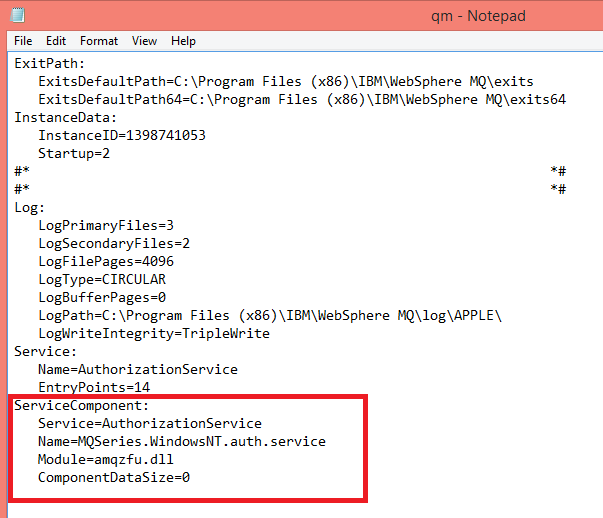 We can write custom OAMS and associate with the QMGR by editing the "qm.ini" file. Good one Jessin, you should have also posted a BIG BOLD warning in the end saying "Do not mess with or alter the SYSTEM.AUTH.DATA.QUEUE object"
Also I have seen depth alert warnings during audit or monitoring this queue which can very well be ignored, or if you need to reduce the depth of the SYSTEM.AUTH.DATA.QUEUE, use only the 'setmqaut' command to achieve what you need. (04-29-2014, 09:15 PM)limal.raja Wrote: Good one Jessin, you should have also posted a BIG BOLD warning in the end saying "Do not mess with or alter the SYSTEM.AUTH.DATA.QUEUE object"
Thank you Limal for adding that important point which i missed out. If this queue is altered by someone other than the queue manager, it will break the users permission on the queue manager. This is one of the issues you might encounter if you mess up with SYSTEM.AUTH.DATA.QUEUE. Here the problem is SYSTEM.AUTH.DATA.QUEUE is made put disabled by someone. Altering the parameter to put enabled resolves the issue and listener object can be created then.